In your Dashboard menu, choose Contacts and click List Hygiene. Click the Add emails button and enter the email addresses or domains in the box provided. Make sure you choose the option to blacklist them. After entering all email addresses and domains, click the OK button. 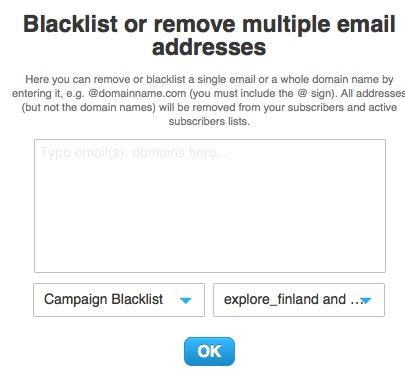 Please note that if just a domain is added, ALL email addresses at that domain are blacklisted.